Amazon has recently published a pair of whitepapers (Paper 1 / Paper 2) describing their proposed approach for determining safe and efficient airspace access and integration for low-altitude, small unmanned aerial vehicles (UAVs). To fully reap the benefits of commercial drone systems in civil airspace, and in order to avoid potentially lethal chaos as per the recent example of a Southern California 3,500 acre wildfire where helicopter firefighting operations were temporarily stopped for 26 minutes due to the interfering presence of five civilian-operated drones, dedicated “air lanes” and air traffic control systems will be key to avoiding a bleak dystopian “delivery drones blocking out the sun” future outlook. Below 200 feet (61 meters) a “Low-Speed, Localized Traffic” area reserved for “(1) terminal non-transit operations such as surveying, videography and inspection, and (2) operations for lesser-equipped vehicles, e.g. ones without sophisticated sense-and-avoid (SAA) technology”. 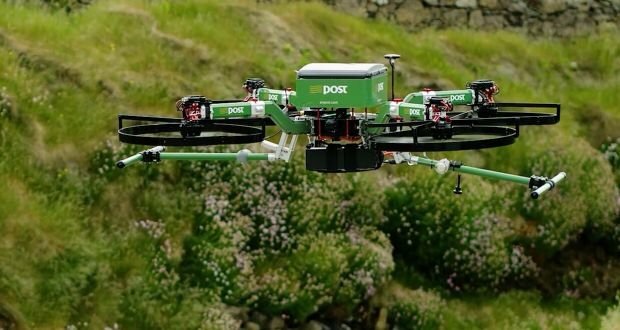 Potentially, this area would also be the airspace where Amazon Prime Air drones would complete the final stages of their parcel deliveries, landing near homes to drop off Amazon packages. Between 200 feet (61 meters) and 400 feet (122 meters) a “High-Speed Transit” space, “designated for well-equipped vehicles as determined by relevant performance standards and rules”. Most likely this area would be reserved for autonomous UAVs traveling at high-speeds and beyond the visual line of sight (BVLOS) of their operators. Minimum requirements would be inter-drone communication as well as standardized sense-and-avoid technologies to avoid collisions amongst themselves and other potential hazards such as birds and tall infrastructure. Between 400 (122 meters) and 500 feet (152 meters) a permanent ‘No Fly Zone’ in which “sUAS (small unmanned aerial systems) operators will not be permitted to fly, except in emergencies”. Finally, this airspace model will also encompass ‘Predefined Low Risk Locations.’ Altitude and equipage restrictions in these locations will be established in advance by aviation authorities. These Predefined Low Risk Locations will include areas like designated Academy of Model Aeronautics airfields, where members will meet preestablished parameters for altitude and equipage. What are your thoughts on the establishment of a dedicated unmanned drone highway? Comment below!